House Hlaalu is one of the five Great Houses of Morrowind. 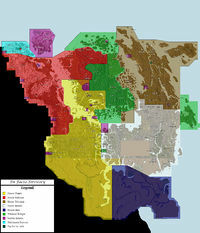 It governs the Hlaalu District of western-central Morrowind from its ancient capital of Narsis. In the district of Vvardenfell, the house's council seat is located in Balmora. The Hlaalu value personal self-sufficiency & autonomy, ingenuity & entrepreneurship, and cunning. They are playing a game that is bigger and more self-conscious than any other Dunmer. They have no objection to lying, in general. The House is largely concerned with business and diplomacy, seeking to strengthen ties with at times unconventional allies such as the Empire. One thing should be understood about the Hlaalu ideology: it is not capitalism. The Hlaalu ideology has much more in common with mercantilism. The Hlaalu seek to profit themselves, the House, and Morrowind through economic activity. They are generally unscrupulous. They use force to set up house-enforced monopolies and economic regimes. The Hlaalu become independently wealthy through a variety of activities. Primary agricultural crops in Hlaalu areas are comberry, hackle-lo, wickwheat, meadow rye & or scrib cabbage. The core of the house is the Hlaalu Council Company, which acts as the central administrative organ. The Company does not itself participate in any productive industry. It earns money by controlling the avenues of trade in Hlaalu territory. It controls border passes at Kragenmoor & Shadowgate (west of Narsis), allowing it to charge tariffs on all products which pass in and out of Morrowind (at favorable rates to Hlaalu merchants, of course). Hlaalu society is a society of disguises in which things are frequently not as they seem. An open port full of commerce is run by cheating, chauvinistic tongs. A small publican's hides a Twin Lamps safeh ouse in its basement. A shipping magnate carries a fortune in Skooma in the hull of his boats. And most importantly, the Hlaalu elite carry an uttermost confidential secret. Light Armor, Marksman, Mercantile, Security, Short Blade, Speechcraft.